ANT Industrial Works, Inc. engages in the fabrication, installation, and maintenance of Mechanical Engineering Works such as Heating, Ventilating and Air Conditioning – Ducting and Piping Systems, Automation Controls, Fire Protection Systems, Plumbing Systems, Compressed Air Systems and other related applications in Industrial and Commercial buildings. The company started out as ANT Enterprise in 1987, a consumer electronics repair hub. It then dived into the design and manufacturing of energy saving and power protection devices. It saw the opportunity to be an alternative service provider, offering inexpensive maintenance, comprehensive repair, rehabilitation and calibration of HVAC controllers. The company incorporated on March 4, 1994 as ANT Industrial Works, Inc. It is now a member of the Israel Chamber of Commerce of the Philippines (ICCP), the Philippine Society Ventilating, Air Conditioning and Refrigerating Engineers, and the Philippine Society of Mechanical Engineers. It is also Graded A by the Philippine Contractors Association Board. ANT Industrial Works also offers professional services such as facilities management and consultancy. 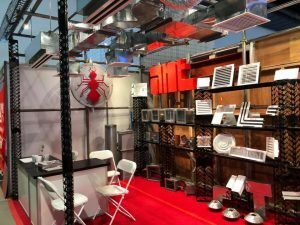 It abides by the strict rules of Sheet Metal and Air Conditioning Contractors’ National Association Inc. (SMACNA) by using only approved sheet metal that conforms to locking form qualities needed. 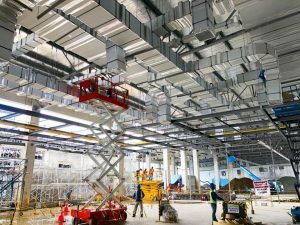 The company’s biggest client to date is New Kinpo Group which entrusted the fabrication, installation, and insulation of the Air Conditioning, Ventilation, and Process exhaust Ductworks System of their 102,000 sq m building to the company. Its other clients include EDSA Shangrila-Brother and Canon Philippines. Being a member of the ICCP, ANT Industrial Works believes in not only servicing its clients, but also serving its community. It has built ties with its community by partnering with youth foundations like Metro World Child Foundation and Kapatiran-Kaunlaran Foundation, Inc.
For information on its services, call (+632) 736 7191, e-mail [email protected], or visit the company’s website at http://www.antindustrialworks.com/. The company’s main office is located at Block 21 Carmelita Street, Stateland Hills Subdivision, Manggahan in General Trias, Cavite.